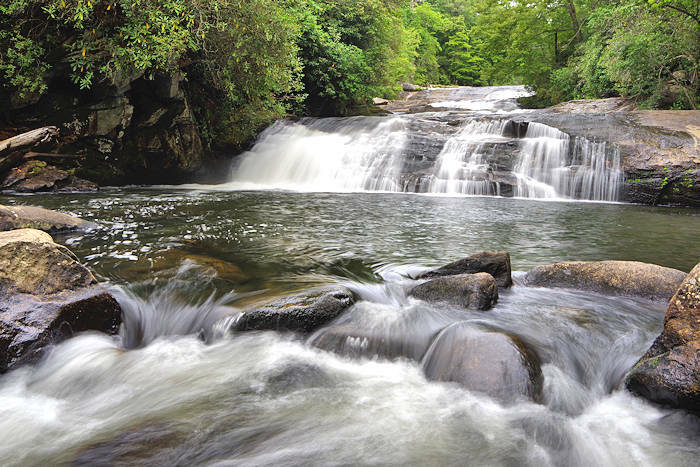 Stairway Falls (sometimes called Stair Step Falls) in the Horsepasture River in Pisgah National Forest is often overlooked by the many folks hiking to nearby Rainbow Falls. From that trail, it's just a half mile round-trip detour to see this multi-tier waterfall. 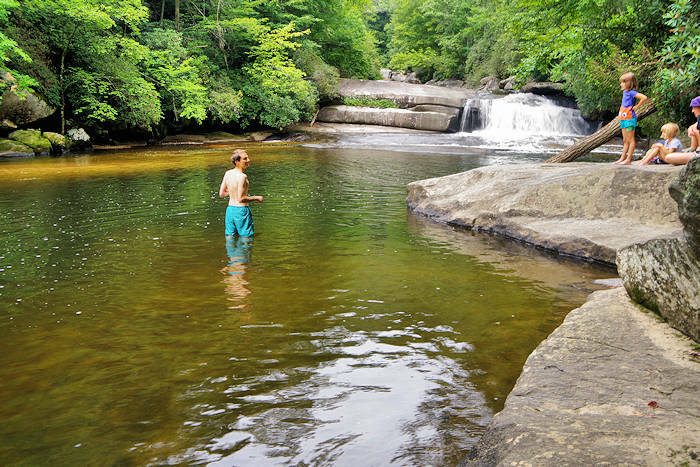 The 50-foot cascades drops into a pool with plenty of boulders for enjoying the view. The trail begins in Gorges State Park. 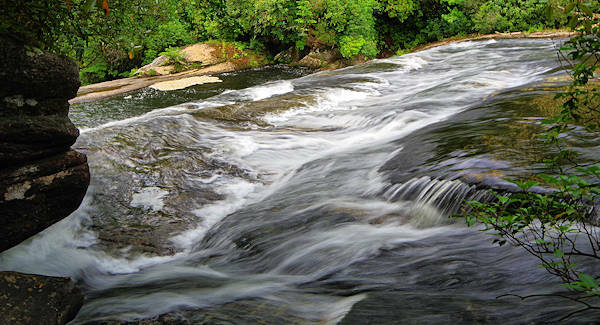 The Horsepasture River is an 18-mile-long National Wild and Scenic river that flows from Jackson County to Lake Jocassee. Before reaching the lake at 1,100 feet elevation, it drops about 2,000 feet creating many waterfalls and rapids along the way. You can hike a 1.5-mile riverside trail from Stairway past Turtleback Falls, passing Rainbow Falls and Hidden Falls along with many scenic rapids. To start your hike, go to the Grassy Ridge parking area in Gorges State Park. The Rainbow Falls trail begins by the bulletin boards at the end of the parking area. This area is a temperate rain forest, receiving 90 inches of rain a year. So summer showers are frequent! 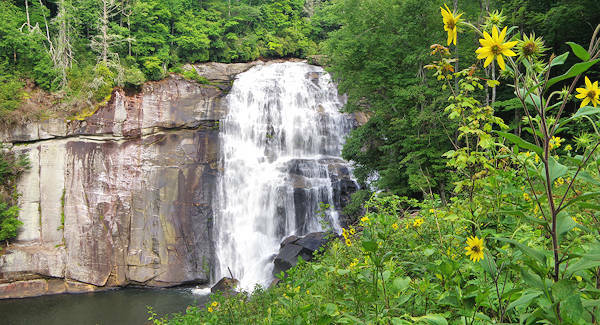 With a four-mile roundtrip hike, you can see four waterfalls. About a mile down the well-maintained trail (mostly downhill), look for a metal post on the left and turn left on the side trail. It's past the sign about entering the National Forest. It's only a quarter mile from this point to Stairway Falls, but the trail is steep and narrow. After descending a short distance, you'll reach the river and campsite. This is the top of Stairway Falls (pic above). Continue on the trail down river to reach the base of the waterfall. Again, it's steep so wear your good hiking shoes! You'll see a side trail to the right that takes you to the top tier of the falls. But continue straight and the trail will take you to the base pool. There's another campsite there that is seldom used. Enjoy the view from the boulders or you can deep your toes into the water. Boulders that surround the pool dams the water to create a deep swimming hole. But be careful of rocks under the water. To continue to Rainbow Falls (pic above), follow the same trail back to the campsite at the top of the waterfall. Then follow the riverside trail upstream. In about two tenths of a mile, you'll reconnect with the main Rainbow Falls trail. Except a few steep sections that snake along clifftops along the river. Turn left on the Rainbow Falls Trail to reach Rainbow in about a half mile (and Turtleback Falls after that). Or turn right to return to your car. Driving Directions: Gorges State Park is approximately 55 miles southwest of Asheville (1.5 hours driving time). From Asheville, take I-26 East to exit 40 for Airport. Turn right onto NC 280 and traveling west toward Brevard. 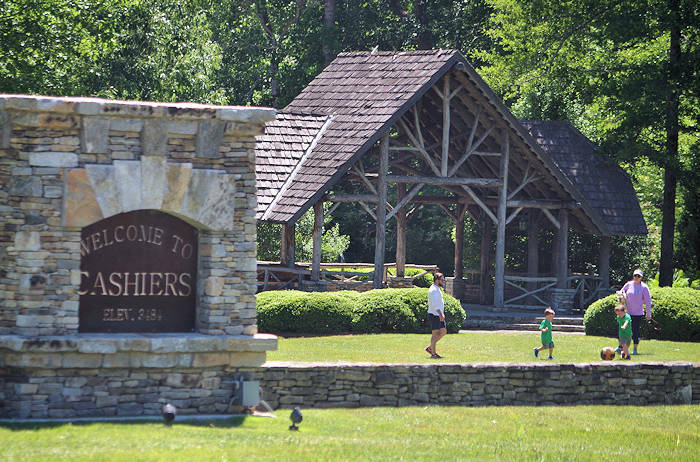 Turn west on US 64 and travel toward Sapphire. To reach the Grassy Ridge Access, drive about two miles inside the park. You'll pass the park Visitor Center, so you should definitely stop there. Read more about the Park.